Hair loss is often one of the most stressful symptoms of hormonal imbalance in women. Although common in those transitioning through periods of reproductive significance, such as menopause, due to drastic estrogen fluctuations, hair loss can also be due to DHT. Continue reading to learn about all you need to know about DHT-induced hair loss, including why it happens and treatment options, to stop your beautiful locks from shedding any more. Dihydrotestosterone, or DHT for short, is an androgen that stimulates the development of male characteristics. It is often made from the less potent androgen, testosterone. The overproduction of DHT in women is often the result of excess testosterone production. How Does DHT Cause Hair Loss in Women? 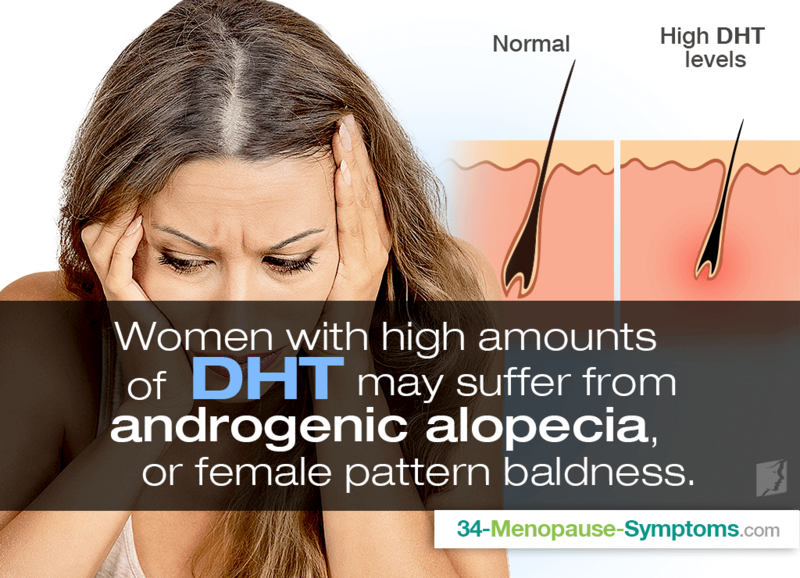 Women with high amounts of DHT may suffer from androgenic alopecia, or female pattern baldness, as the high levels bind to receptors in scalp follicles, causing them to shrink and eventually fall out. Then, when new growth comes in, it is generally miniaturized. One of the most important factors in whether DHT will cause hair loss is genetically-determined sensitivity of the follicles to DHT in addition to their different reactions to concentrations of androgens. While it is true that men who have hair loss tend to develop a receding hair line and bald spots, preliminary signs of female pattern baldness are general thinning with a widening part. Even though the scalp may be able to be seen, her hairline usually does not recede. How Can DHT Hair Loss Be Reversed? Oftentimes, hair loss treatments will depend upon the extent of the hair loss as well as other factors. Nevertheless, less invasive actions can be taken first. For instance, women suffering from female pattern baldness should improve diets. Certain deficiencies in necessary nutrients, like iron and protein, can cause or aggravate hair loss characteristic of androgenic alopecia. Also, participate in stress-reduction techniques like yoga or meditation, as extreme stress can also provoke hair loss. Moreover, because hormones are at the root of hair loss due to DHT, one of the most natural ways for women suffering from androgenic alopecia to improve their condition is through the use of hormone-regulating supplements, which work with the endocrine system to encourage natural hormonal balance. Pharmaceutical options for hair loss from DHT include topical medications like Minoxidil; the diuretic spironolactone that blocks androgen production; or surgeries, such as laser treatment or hair transplants. Also, in general, it would be wise to avoid the use of aggressive styling patterns, like perming, straightening, wearing tight ponytails, or brushing the hair when it's wet. Dihydrotestosterone, or DHT, is an androgen that can bind to receptors in women's scalp follicles, causing hair follicles to shrink and eventually fall out. DHT-induced hair loss in women is often a genetically determined sensitivity of the follicles to androgen. Treatment depends upon how advanced the condition is in addition to other factors. Nevertheless, less invasive actions of lifestyle changes followed by the use of alternative medicines, like hormone-regulating supplements, can do a woman wonders. In the meantime, she should look to prevent any further damage by properly caring for her hair. Rest assured that this trying time can end, and your beautiful locks will once again be on your head instead of in the brush or shower drain. Understand why hair loss in women over 40 occurs, and discover ways to deal with it and promote healthy hair growth. Hair loss is a common symptom of the menopause transition. Click here to learn more about how hormones affect it.